Shows how to easily make a Windows file manager with multiple views by using MFC framework and IExplorerBrowser interface. Using the MFC D2D classes for making a simple image viewer. Demonstrates how to easily make a simple image viewer by enabling MFC Direct2D support. Using IKnownFolderManager and IKnownFolder in an MFC application for listing the Windows known (special) folders. A free wrapper library for WIC (Windows Imaging Component) interfaces. Adds new methods and classes to WIC Wrapper Library. WIC Wrapper Library has been improved for rendering WIC bitmap sources, by using Direct2D. Using IFileOpenDialog and Windows Imaging Component interfaces to create File Open Dialog that automatically filters WIC supported image files. Shows two ways to get Visual C++ sample code projects. About using and the effect of TVS_EX_RICHTOOLTIP tree-view control style. Shows how to programmatically check the Windows version beginning with Windows 8.1. A look at several new algorithms in C++11 that C++ developers should know about. A short walk through the assignment algorithms in the C++ standard library. A brief introduction in C++ lambda expressions. This article explores the ref-qualifiers in C++11. An overview of cooked user-defined literals in C++11 and additions to C++14. A walk through the numeric operations available in header <numeric> in the C++ Standard Library and shows real world examples. Learn about the standard way in C++11 of converting between numbers and strings (using to_string or to_wstring) and the other way around (stoi, stol, stof, stod). A trick for quickly get a “start menu” like the classic one in Windows 7, Windows 8 and Windows Server 2012. This entry was posted in Anunturi, Comunitate, Uncategorized and tagged atl, c++, C++11, mfc, stl, Windows API on 2015.01.02 by Ovidiu Cucu. Generally, it’s not necessary to change the dialog’s default background. Besides, if have to display an image in a dialog, it is preferable to do it in a child control (e.g. static picture or custom control). However, let’s say that’s a requirement or we want to do it as an exercise or just for fun. The image shows a dialog that has its background painted with a fancy brush. 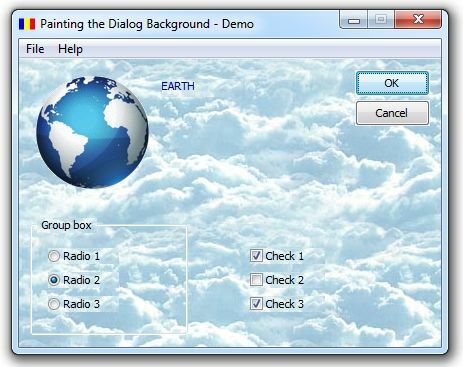 It also has a nice Earth image, transparently painted directly in the dialog’s client area. Let’s see how to make it!. This example handles the WM_ERASEBKGND message and fills the background by using a custom brush. Finally, it returns TRUE to prevent further erasing. Next’ we would notice that’s necessary to handle WM_CTLCOLOR in order to change also the beackground of some child controls (static, radio buttons, etc.). As long as, WM_CTLCOLOR allows also changing the dialog’s background, we can get rid of previous method and do all the work in the WM_CTLCOLOR message handler. To change the default background as well as other attributes, WM_CTLCOLOR message handler (OnCtlColor) must return a not-NULL brush handle. Note: In Win32, WM_CTLCOLOR notification message was replaced by WM_CTLCOLORDLG, WM_CTLCOLORSTATIC, and so on. However, MFC still keeps WM_CTLCOLOR for 16-bit legacy code compatibility. The third argument (nCtlColor) of OnCtlColor handler function, helps us to decide if in fact has been received one of the following notifications: WM_CTLCOLORDLG, WM_CTLCOLORSTATIC, etc. Finally, let’s “paint the Earth”! As in any other kind of window, the right place to perform paining is the WM_PAINT message handler. Download the demo project and you can find more implementation details. This entry was posted in MFC, Uncategorized and tagged dialogs, mfc on 2013.03.13 by Ovidiu Cucu. Among other common Windows dialogs we can find Color Dialog Box that allows to pick a color for our purposes. It can simply be created by a call of ChooseColor WinAPI function or, if using MFC, with the help of CColorDialog class. Also, the MFC versions shipped with Visual Studio 2008 or newer, include CMFCColorDialog class which shows a little bit more fancy color selection dialog. However, let’s say we have to make our own custom color picker control (let’s say, looking similar tho one used in Photoshop). Beside making a custom or ActiveX control from scratch, a faster approach is to customize the Windows listview (“SysListView32“) control, kept in MFC by CListCtrl class. There are two ways to customize a listview control: making it custom-draw or making it owner-draw. First we have to handle NM_CUSTOMDRAW notification, sent via WM_NOTIFY. In subitem pre-paint phase, we can indicate which color has to be used to paint whatever list subitem. Finally, hadle NM_CLICK notification, get the color of the clicked item and send a user message to the parent. This method is pretty simple but it has a disadvantage: we cannot modify item/subitem height. So, if this is necessary we gave to make an owner-draw listview control. 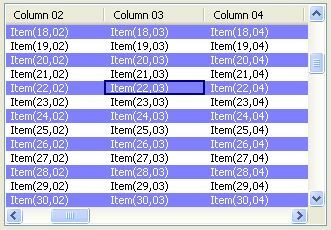 An owner-draw listview control must have LVS_OWNERDRAWFIXED style set (“Owner Draw Fixed” property must be set to “True” in the resource editor). Next, we can handle WM_MEASUREITEM to set item size and override CListCtrl::DrawItem in order to perform custom drawing. Just to note: would be necessary to map by hand the WM_MEASUREITEM message; also DrawItem isn’t called for each subitem. The color pickers presented here are just draft versions intended to demonstrate how to do. You can further improve them by adding new features like loading a custom color palette, adding custom colors on the fly, and so on. A brief presentation of custom-draw and owner draw controls, can be found in this article: Custom Draw vs. Owner Draw Controls. This entry was posted in MFC, Uncategorized and tagged color picker, listview, mfc on 2013.02.23 by Ovidiu Cucu. In a previous post I introduced the C++11 support for threads. In this article I will discuss the locking features provided by the standard that one can use to synchronize access to shared resources. mutex: provides the core lock() and unlock() and the non-blocking try_lock() method that returns if the mutex is not available. recursive_mutex: allows multiple acquisitions of the mutex from the same thread. timed_mutex: similar to mutex, but it comes with two more methods try_lock_for() and try_lock_until() that try to acquire the mutex for a period of time or until a moment in time is reached. recursive_timed_mutex: is a combination of timed_mutex and recusive_mutex. Here is a simple example of using a mutex to sync the access to the std::cout shared object. In the next example we’re creating a simple thread-safe container (that just uses std::vector internally) that has methods like add() and addrange(), with the later implemented by calling the first. Running this program results in a deadlock. The reason for the deadlock is that the tread that own the mutex cannot re-acquire the mutex, and such an attempt results in a deadlock. That’s were recursive_mutex come into picture. It allows a thread to acquire the same mutext multiple times. The maximum number of times is not specified, but if that number is reached, calling lock would throw a std::system_error. Therefore to fix this implementation (apart from changing the implementation of addrange not to call lock and unlock) is to replace the mutex with a recursive_mutex. Notice the same numbers are generated in each call to func(). That is because the seed is thread local, and the call to srand() only initializes the seed from the main thread. In the other worker threads it doesn’t get initialized, and therefore you get the same numbers every time. Explicit locking and unlocking can lead to problems, such as forgetting to unlock or incorrect order of locks acquiring that can generate deadlocks. The standard provides several classes and functions to help with this problems. lock_guard: when the object is constructed it attempts to acquire ownership of the mutex (by calling lock()) and when the object is destructed it automatically releases the mutex (by calling unlock()). This is a non-copyable class. unique_lock: is a general purpose mutex wrapper that unlike lock_quard also provides support for deferred locking, time locking, recursive locking, transfer of lock ownership and use of condition variables. This is also a non-copyable class, but it is moveable. Notice that attempting to call try_lock_for() or try_lock_until() on a unique_lock that wraps a non-timed mutex results in a compiling error. Apart from these wrappers for mutexes, the standard also provides a couple of methods for locking one or more mutexes. lock: locks the mutexes using a deadlock avoiding algorithm (by using calls to lock(), try_lock() and unlock()). try_lock: tries to call the mutexes by calling try_lock() in the order of which mutexes were specified. Here is an example of a deadlock case: we have a container of elements and we have a function exchange() that swaps one element from a container into the other container. To be thread-safe, this function synchronizes the access to the two containers, by acquiring a mutex associated with each container. Suppose this function is called from two different threads, from the first, an element is removed from container 1 and added to container 2, and in the second it is removed from container 2 and added to container 1. This can lead to a deadblock (if the thread context switches from one thread to another just after acquiring the first lock). Hopefully this walktrough will help you understand the basics of the synchronization functionality supported in C++11. This entry was posted in C++, Native, Uncategorized and tagged c++, C++11, concurrency, mutex, parallel, sync, threads on 2013.02.20 by Marius Bancila.